email me if you like my work. 4/20/2006 - "What happens to old Mods?" 4 housing moves later, LovePC has been sitting in my closet(s) for nearly 3 years... Since sponsor support for my next mod has been pretty slow, it's time to take matters into my own hands. Over the next few days/weeks, I'll restore LovePC to its former glory with an updated CPU and motherboard, replacing lights, the PSU, and getting the LCD functioning again. Once done, I'm going to try my luck on eBay and see how much I get get for this thing. It's had its share in the limelight, so maybe some kind soul could ante up a bit of cash to help fund my hobby! Check back for updates! I've released an ASP AJAX Link Tracker that keeps a list of link clicks. This is different than a hit counter or a visitor log because the Link Tracker is a utility you add for each of your web pages. A special hotkey (Ctrl-X) triggers the Link Tracker and overlays all links on the page with a hit counter. This is especially useful for analyzing what links are popuplar to your visitors. I've been working on a VB.NET application these past few weekends. If you use Outlook Web Access to check email, you'll know that the new mail notification is a little lacking. This program is basically an Outlook mail icon that sits in your system tray to monitor your Outlook Web Access account. It notifies you with msn-style popups when you have new mail. Hey everyone! I had my friend help me design a new layout for my site. Shout outs to OutCaster for the awesome design! about my ToiletPC and also about my PVC Jr. We have been in contact ever since he wrote an article about my PVC II computer in his October 2000 issue of the Japanese tech magazine "ASCII"
find information about computer hardware, overclocking and the latest computer news. Getting linked on HardOCP is definitely an honor. was a Consummate Computer Competition (C3) hosted by HardOCP. I brought BBQPC to the event and won 2nd place in the Showpiece category. attended. I thought it would be fun to bring something interesting to the event. PlanetQuake decided to have a case competition and PVC II was awarded Grand Prize. laptop. I've got this ferocious attack kitty guarding it. Shh! Don't wake her! modder (me) gets an email from Lenovo wondering if I'd be interested in doing a mod for them on a new site they're building. The theme is, "What's your idea of fun?" After a thinking back to my childhood, I can definitely answer, "ARCADES!" event in Dallas. I never got around to taking pictures of the computer and posting them online. Finally, Spring of 2006, I've uploaded the page. Enjoy! mod with a music theme to it. The GuitarPC features a windowed cdrom mod with stealth door, built-in speakers, and blue accent lighting. Computer power button and cdrom eject button are both remote controlled with a keychain remote. holiday mod! Hehe. I had tons of fun making this Gingerbread House PC. The computer is 100% non-perishable. I took an arts-and-crafty approach for this creation. The Internet has been a great place for me to learn about computers and meet great friends. Here's my chance to give back a little. In my spare time (what little I have) I've been working on an online bill splitting calculator. I envision this as a simple tool that roommates, co-workers and friends can use whenever the need arises. All you do is enter the list of bills/expenses and list the people and hit the calculate button. The bill split calculator then spits out a list of payment instructions. Easy as 1-2-3. I plan to expand the bill split calculator to handle logins and groups of users (like roommates). I guess you've noticed that my cases all have a "Time Spent" note on each of them. I've been getting questions about this so I thought I'd clarify on this and even add my 2 cents to the discussion. The "Time Spent" is the time I actually spend working on the case... building it with tools and other devices of mass destruction. This time doesn't include the time I spend thinking about it in my spare time -- like when I'm sitting on a plane, daydreaming or when I'm eating breakfast. Times like that don't count toward the overall "Time Spent" calculation. On those time measurements, 1 week does not mean 1 entire sleepless week of working either. Normally each day it would be 2 to 3 hours of work, or maybe a 5 or 6 hour stretch on the last night. So, to answer the question many of you are probably dying to ask, "No, I do not have way too much time on my hands." Everyone has a hobby - stamp collecting, baseball cards, music, etc... And for any hobby, people will find the spare time to spend, be it skipping this week's Simpson's episode or just having the time on a lazy Sunday afternoon. By day, I am a database and computer network consultant. It shouldn't seem odd that my hobby is computer-related. In fact, my clients find it to their benefit to have someone that has a genuine personal interest in computers and a good working knowledge of the hardware. 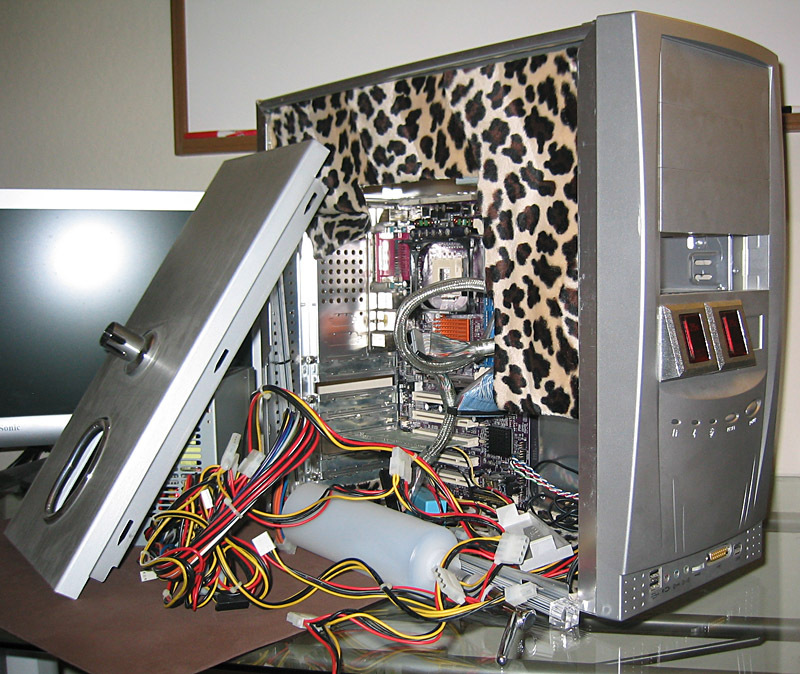 In its own way, computer case design of this sort ( some might call it case modding, but in this situation, I'm not "moddifying" a case in the litteral sense; I'm creating cases from scratch) could be an expression of art. Whatever you want to call it, I call it my hobby.